I know it’s been forever and a day, but there’s a new blog post on my exclusive content blog! The very first exclusive blog post regarding Allie’s Return has finally come out! 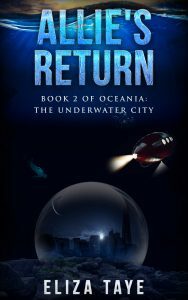 Like for Oceania: The Underwater City, I’m sharing with you the inspiration for the story. You’ll find out why I decided to write Allie’s Return and what prompted me to do so. If you haven’t had a chance to read Allie’s Return, please do so before you read this blog post to prevent spoilers. Based on reader suggestions, there’s a new blog post with a character personality quiz! You can take a twelve-question quiz to find out if you’re most like Allie, Dylan, or Dr. Wilcox. Visit my blog at the link below to take the quiz. I have a special new blog post on my author blog! This week I’m sharing some deleted scenes I omitted in earlier versions of the novel. I chose only a couple to share, but I think each of them are ones you’ll enjoy. Please leave me a comment or email me at elizataye@gmail.com to tell me whether or not you wish they were kept in the novel or if you’re glad I took them out. Wow, I can’t believe I’ve already written sixteen blog posts about Oceania! Well, I skipped the announcement of the last blog post, which is why I am coupling it with this one. Blog post number 15 has a little bit of a surprise in it. Blog post number 16, Reader’s Questions Answered!, is pretty self-exclamatory. I hope you enjoy them both! I have a new blog post on my author blog! This one’s a little different than the others I’ve posted. This one gives a brief history of Oceania as a city. All of the information is new to you and you won’t find it in the novel. If you’re curious about the history of the underwater city, check out the blog post!